F1 Pause the game without displaying "GAME PAUSED"
Start the game with the parameter ¿. That's an inverted question mark. It can be entered by holding down Alt and pressing 168. 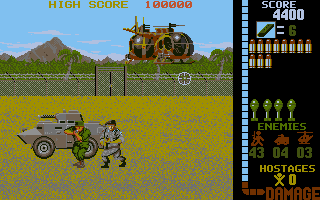 Now the Taito screen is drawn differently, a story and special thanks are shown during the demo mode and there's a message in the high score list from William Rieder, the programmer of Operation Wolf, confirming that this is an Easter Egg. Some of this might not be shown in all graphics modes, but most of you are probably running this game in VGA mode and fortunatly all these changes are shown in this graphics mode. Operation Wolf at MobyGames Operation Wolf's entry in the game database. Operation Wolf at Wikipedia Operation Wolf's entry in the free encyclopedia.